Here are two new songs from the band PAROUSIA 2019, with Patt Connolly (vocals/keyboards/flute); Garth Huels (acoustic /electric guitar); Robert Lowden (bass guitar/electric guitar); Gerry North Cannizzaro (drums), the same four musicians who wrote and produced over 90% of Parousia’s material from 1982 to 1986, the band’s most prolific writing period. These four key members last recorded together in 1986 and after 33 years, come together now to present a new set of recordings in the classic Parousia style. “No Songs For Mary” – a dark and intensely moody alt-rock song lamenting the emptiness of living when your loved one has departed this world; lyrics by Gerry Cannizzaro and Patt Connolly, influenced by the John Donne poem. “For Whom The Bell Tolls”. “The Weekday Song” – an upbeat progressive rock song that questions the practicality of loving someone who is unobtainable. This song features the band’s signature heavy guitar vs. rock-flute sound, reminiscent of some of the best Parousia recordings such as “The Weekend Starts Tonight” from the “Loft” album (1984) ” and “Place Your Bets” from the “Turnaround” E.P. (1987). The two songs featured here were recorded in 2018; mixed and mastered by the band in 2019 at Saturn Studios, Hollywood, CA. 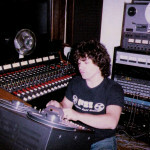 All tracks were recorded live onto 24-track ADAT hard-disk recorder. Drums consisted of a Roland V-drum-kit triggering Roland R8, Simmons SDS-9 and Roland TD11 sound modules. Keyboards were recording using a Korg DS-8 and a Fatar SL-1100 weighted 88-key keyboard triggering a Roland U-220 and Alesis QSR8 sound modules. SD Curlee bass guitar recorded direct and Riff electric guitar processed using an AVID Eleven Rack sound module. Yamaha Silver flute and Selma nickel-silver flute recorded using an Audio Technica AT4050 condenser mic. In the late 70’s and early 80’s Parousia was a seven-piece rock group that performed in Western NY and Canada. The band was known locally as a classic rock / progressive rock band that featured original music in their sets and was set apart by their rock-flutist/front man Patt Connolly. In 1979 the band played a concert at U.B.’s Katherine Cornell Theater and broadcast live on WBUF “The Oil OF Dog Radio Show” hosted by Gary Storm. In 1981 the band’s song “Miss Ogyny” landed a spot on Buffalo’s first 97 Rock album, performed at Uncle Sam’s and broadcast live on WGRQ. The seven-member Parousia disbanded as a cover band in 1982 and reformed that same year, streamlined down to the four key contributors of the music and lyrics, Patt Connolly (vocals/keyboards/flute), Garth Huels (acoustic /electric guitar); Robert Lowden, (bass guitar/electric guitar) and Gerry North Cannizzaro (drums). Throughout the period 1982-1986 the band performed in local clubs and held showcases in Buffalo and Kenmore NY., recorded 16 original songs in various Buffalo, NY studios such as Select Sound in Kenmore, Loft Studios in Cheektowaga and Mark Studios in Clarence; In 1985 produced a concept music video to their song “Keep Running”, broadcast locally on Buffalo Television. In 1986 the band relocated to Hollywood and in 1987 released “Turnaround” a four song E.P. on an independent Hollywood record label, sold at record stores in Buffalo, NY and Los Angeles, CA such as Record Theatre and Rhino Records. Tracks from the E.P. received airplay on Los Angeles alternative rock station K.R.O.Q. and classic rock station K.L.O.S. In 1989, “Tiffany” the third track from the band’s “Turnaround” E.P., landed a spot in the movie soundtrack of “Stepfather II”. From 1988-1992 Parousia continued to write and perform original music, opened for national acts at various venues throughout Los Angeles County and Orange County CA, including West Hollywood clubs, The Whisky, The Roxy, The Troubadour, The Palomino in N. Hollywood and Bogart’s in Long Beach where the band was recorded live and their song “The Weekend Starts Tonight” was later broadcast on “The Hollywood Showcase TV Show” as a finalist. I love both of these two new songs by my old band Parousia. Their creativity is astounding and never ceases to amaze me as they effortless transition through time. Best of luck to my old band mates. Take care and God Bless ! First off, you know I’m biased BUT I think these songs are amazing. It’s like you guys haven’t missed a single day in the studio. I mean… they’re more mature and polished perhaps but so completely, distinctly Parousia. You know, I can relate to and instantly loved ‘No Songs For Mary’. It’s haunting and beautiful and all of your parts are perfect in it. ‘Weekday Song’ is quintessential Parousia… even before the flute vs drums… and that makes it 100% better. I think these are incredible. I’m so proud of you guys. These sound really good. I really like No songs for Mary. Garth sounds great! Are you going to try to shop these around for air play? Thank you for sharing this with me, these songs look great to throw up on our loud rock chart for this week! Amazing! Congrats, guys! Love both tracks! Thank you for the music, neighbor! Yikes what next, McVans openings back up ! Congrats guys!! Here’s a fun wardrobe fact for Kathy Edholm Castellani Karen Marino Mulhern, Lisa Miller, Patty Ruckinger and all my peeps from the supermarket. Three out of the four smocks that you see the band wearing in the picture were “borrowed” from the meat room of Tops 207! The layers of nostalgia continue… lol. Yup, …could have once been worn by “Pop-Eye” or Jim Couch! – that’s great & too funny !! Gerry so happy for you and the rest of the guys. Sounds real good! Keep the music coming!! Congratulations and best of luck with the new recordings. When is World Tour 2019 going to be scheduled and will Buffalo be on the itinerary? Thanks Mark, much appreciated. Yes, stay tuned for more new songs. Thanks so much, your opinion is especially valued and appreciated. Patty told me your gig went well, cool that you guys had that opportunity, and a much bigger audience than we sometimes did 😄. Like ‘No Songs For Mary’ even more the second time around. Solid song fundamentally: Here is my two cents: could there be spots in the song where the drums take a more out front approach, kicking up the energy or driving the energy of the tune to a ‘destination.’ Double time action or just more intensity at critical junctures to add to the emotional arc of song. Because the tune is harmonic and melodically sparse, i believe the drums can add more. Also, here’s a thought: what about speeding this song up maybe 10 to 16 metronome clicks faster. And with that, the vocals can then be much more effective and interesting. And it could make even more sense for the drums to take center stage at times. I realize when y’all envisioned this song it was maybe closer to a ballad tempo. But I really hear this song as a rocker. The melody would, I think, sound more apropos as an ‘on top of the beat’ melody if it were faster. Because the melody is sparse I think it’s a rocker melody that demands the intensity of a faster tempo. Imagine this and let me know if any of it makes sense. Thanks again Jon, I’ll be sure to share this with the band. Yes, you’re right the song was envisioned to be more of a ballad with a medium tempo to reflect the melancholy emotion surrounding the loss of a loved one. It represents a slow build up in intensity not through an increase in tempo, but rather dynamics, a reflective style used by many of the classic rock groups, Pink Floyd, Zeppelin, Moody Blues, etc.. Also, this song may make more sense in context. It is part 2 of a song we haven’t yet recorded called “Mary’s Gone” which we plan to record as a prequel to “No Songs For Mary”. (fingers crossed).